Mr. Potts is in a sour mood and is out to get Simon’s Cat and his friends. 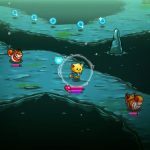 The Critters were all caught in bubble traps, and it is up to you to save them! 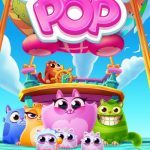 Simon’s Cat Pop Time is a fun bubble shooter title from Tactile Games, that’s out now on Android and iOS platforms. In this game, you will be shooting colored bubbles to match the existing ones on the board. Successfully matching the colored bubbles will pop them, allowing you to save any creatures trapped inside. Work with Maisy, Chloe, Kitten, and Jazz in conquering all the stages in order to rescue everyone from the wrath of Mr. Potts. There are hundreds of levels for you to complete, each one more difficult than the last. 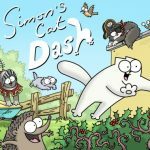 You will need the help of our Simon’s Cat Pop Time cheats, tips and tricks if you want to get three stars on all of them! Since your goal is to get three stars for each level, you should take time to know how you earn points in the game. Earning more points in each level will help you get more stars. Knowing how these points are awarded will help you prioritize certain moves over others. Check out the list below for a better understanding of the point system. Bubble Popping – Each bubble you pop will reward you with 10 points. Since you need at least three of the same color to make a match, the minimum number of points you get is 30 points. The more bubbles you pop in a single move, the more points you earn. Score Multiplier – Your starting multiplier is 2. That means the points you get for popping bubbles is multiplied by 2. This multiplier increases by one whenever you pop bubbles. That means you can easily raise the number of points you earn per move by making consecutive match. If you make a move that does not result in a match, your multiplier is rest to 2. Falling Bubbles – When you make a match and pop bubbles that are higher on the board, the ones below it will fall to the ground. Fallen bubbles are worth 20 points each, so they are not completely wasted. Trapped Creatures – Popping a bubble with a creature trapped inside will reward you with 500 points. Before you start shooting, check out the board for large clusters of same-colored bubbles or for trapped creatures. If you play your cards right, you should be able to raise your multiplier first by popping a few small bubble clusters before going for major points. For example, if you see a trapped creature that can easily be set free, you can opt to make a few matches first to increase your multiplier before aiming for that 500-point bonus. That way, you can multiply those 500 points by a lot. Make sure you don’t miss out on freeing any of the creatures, though. You might end up focusing too much on raising multipliers that you forget to pop the bubble traps later on. There are several power ups available for you to use. Since these are not unlimited, make sure you use them only when you stand to gain a lot of points. Look for large bubble clusters to use your power ups on in order to maximize your score. You can even combine two or three power ups in order to clear several bubbles at the same time. If you want to hit bubbles that are higher up the board but there are other bubbles in the way, you could try some bank shots. To do this, you just need to aim at the walls to make the bubble bounce off at an angle. It takes a bit of practice to master the aim. Think of it the same way you would make a cue ball bounce off the sides of the table. You could spend some coins to buy the Owl Vision booster that would help you see the exact path your bubble would take, but it’s really just best if you take time to practice your bank shots. Jazz has a clockwork mouse that can remove the top line of the bubbles. That means all the bubbles below will fall to the ground, earning you 20 points apiece. While that sounds like a great way to earn points, you may want to hold off a bit before unleashing the mouse. Keep in mind that you will need to make a few consecutive matches in order to increase your multiplier. Try to raise the multiplier as high as you can before using Jazz’s mouse in order to get the most points out of the falling bubbles. 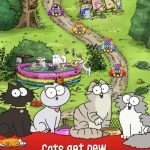 Save the Critters and escape the clutches of Mr. Potts in Simon’s Cat Pop Time! If you follow our advice above you will be raking in all the points you need! In case you know any other hints for the game, don’t hesitate to drop us a line in the comments! I need help with the water balloons in the daily treasure hunt. There aren’t umbrellas in bubbles so idk what to do besides buy coins to get an umbrella. I can’t easily see what shots release the balloons. Having trouble with current treasure hunt, level 8.how do you get past an entries row of rocks? That’s where I’m stuck, at the rock wall. How do you see the top? the bubbles are up there but I can’t see them. I cant get the 2 keys to unlock the gate…ooo frustrating! How do you earn the gold coins? Shoot the crow as it flies close to you. Need help with level 206, getting through the whole row of rock. How do you get through when there is no opening. Make sure you have both of the power ups available when you get to that row of rocks. Combine the 2 power ups and aim at the 3 butterflies above the rock wall. This will release the butterflies and clear that entire row. Can’t get past the spikes things at the top of Level 249. Help! I’m stuck also. Any suggestions? I am stuck there also! I paused a game and now can’t get back and finish it. Can I or is the pause useless? Level 3 flotation devices. How do I move past them and make them go away? Is there a way I may buy for additional power ups? I’m willing to pay. How about the rock wall in 207? Why do I care about getting three stars? Isn’t continuing along the path all that really matters? Also, is it possible to compete a water balloon level without an umbrella? I can’t seem to figure out when the falling water is going to hit me (other than when I hit it dead on)….sometimes popping bubbles above it (making it fall) seems to make it hit me, but, if I can’t do that, how would I ever clear the level?